Some of the large branches that I put aside from the felling of the red gum found a good home, forming the entranceway to both the garage and front decking. We got a local welder to make up some brakets using old galvanised water pipe from the site, and a metal bar that I'd collected from the brick cleaning. The metal bar slots into both the pipe and the base of the pole, which was cemented into the ground, giving it a stable foundation which was braced from above using box beams. The box beams taper off, giving them a japanese / aussie bush look - just what we were after (my partner is japanese). The post was measured and cut to size, the slot position marked and drilled out with a long 8mm bit. The chainsaw was used to deepen the hole and even it out. The tapered box beam in place, with curved box beams connected to it. Cellar to the right. Galvanised corrugated iron was used for the roofing. The long lengths bent nicely into shape on the roof battens mostly by their own weight. A licensed roofing plumber is legally required to fit the roof and guttering. The curved roof is both elegant and practical. The roofing was put up in one day, and because of the aerodynamic nature of the design it provides good protection against ember attack during a bushfire. Gaps in boxed eaves are serious problems because embers can settle in them and ignite the roof cavity - having open eaves nullifies that risk. 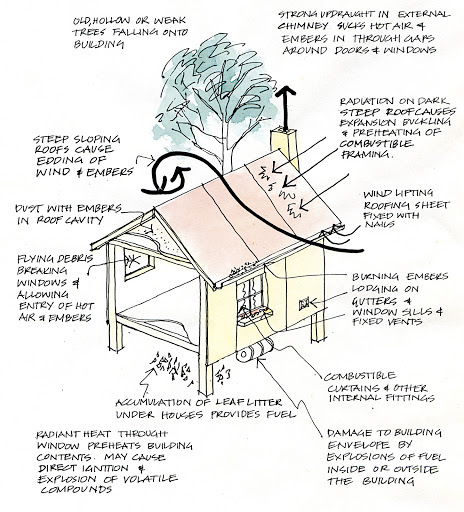 Open eaves are also beneficial during heavy rains, as overflowing gutters cannot run into the house structure. Roofing iron arrives by semi-trailer in sheets up to 10m in length, which will span the entire building in one hit. The bathroom / toilet / greenhouse has a different roofline than the main structure, allowing solar hot water panels to sit directly on the roof. Rafters are reclaimed hardwood wall studs from the original building. Fascias were pre-painted and set up on props, allowing the roofing to be screwed into place. When the props were removed the overhang has strength enough to stand on. The eaves are open, so there's no risk of fire or flooding in them. Wow, I love the graceful curving line of the roof! And the box beam over the tree trunks looks beautiful. Great job! It's really coming together into a fantastic house. omg, Peter is a poster by for unsafe chainsaw practices. Please don't follow his lead. He has no hearing protection, no face mask, no chaps and he's perched precariously on a ladder. I'm sure he's done it safely a million times but it makes me nervous looking at him and I just thought it should be pointed out. Interesting ideas are being put into this house! Yes, not a good example of safe chainsaw operation. He does actually have hearing protection though - ear plugs, not muffs and it would be much better to use a full face mask rather than just safety glasses.